This is a perfect make ahead meal for your weekly prepping. 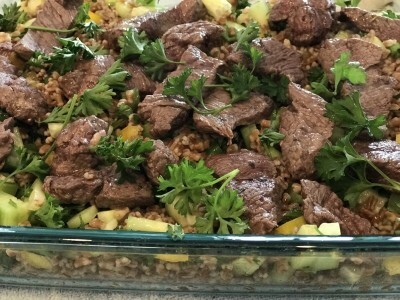 This steak is great cold or make the farro salad ahead of time then grill your steak up! Take your steak and cut into bite size pieces then season with salt and pepper. Set aside. Pour vegetable broth and farro in a saucepan. Cook according to your package instructions. Remove from heat and drain any liquid in the pan. Put into a large bowl and let cool. Once cooled down toss in cucumber, tomatoes and feta cheese. In a mixing bowl whisk EVOO, red wine vinegar, lemon juice, oregano, garlic 1/2 teaspoon of salt, 1/4 teaspoon of pepper. Pour over Farro salad and use a spoon to combine the dressing. Heat a large sauté pan over medium-high heat. Add about 1-2 tablespoons of oil to the pan. Once the oil is hot add the meat and cook for about 2 minutes per side. Remove from pan and top the steak to the salad then garnish with lost of fresh parsley. Note: I like to drizzle a little more EVOO over the entire dish before eating.